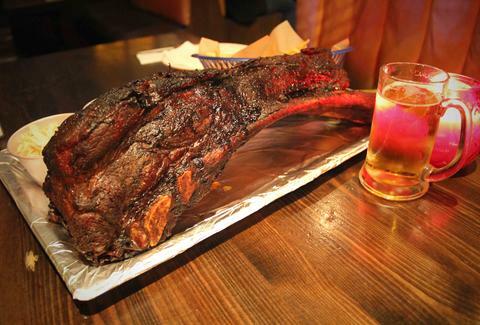 Famed for its live rock, The Blues Kitchen's now getting stone age, with Dino Ribs: a pair of strictly off-menu, cartoonishly large beef bones rustled up by a former Duke's Brew & Que'r, and only available on Rib Mondays. Carrying an imposing two & a half kilos of protein, the belly protectors/fillers are smoked in a mix of cherry/mesquite for 16hrs, then cooked "low 'n slow" for 7hrs to ensure they're "perfectly tender". They're also treated to a 16-spice rub hopefully involving circa-1996 Ginger, and sided by your choice of 'slaw, sweet potato fries, buttered corn, or BBQ pit beans. If you and a friend somehow manage to finish them "plates and bones", your meat-addled minds can choose a drink on the house. A note though: due to the extremely long cook times, the ribs are served on a first come, first served basis, thus ensuring there's no Barney Rubble.